Matthew is an extraordinary person in many ways. He is a gifted hard working athlete, attentive student, compassionate person who is very well rounded in his knowledge. He is ranked 1 in his class and has achieved a 4.0 GPA at Prescott High School with having taken AP classes. The two sport athlete has met many challenges over his athletic career. With those challenges, Matthew won the Division III Arizona State Cross Country Championship in 2017. 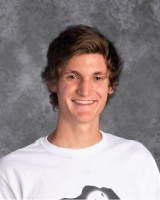 Matthew has also placed in the top three at the State Track and Field Championship; 3200 meter run and 1600 meter run. He shows leadership in such things as daily workouts, teaching young runners what to expect on upcoming courses, watching the time on when to warm up for races, getting the right warm up in and getting their minds ready to race. He directs the team with such a calm demeanor that the team feels at ease and trustworthy under his command. He has worked with younger runners helping and encouraging them how to get better. Matthew has been involved in many school clubs as well as held leadership roles such as a member of the National Honor Society, Vice President of the Environmental Club and the Communications Officer ofr Key Club. Matthew volunteers countless hours at the Prescott Soup Kitchen, the Coalition for Compassion and Justice thrift Store and local food drives. This young man is truly talented and will surely succeed in his college career. Matthew plans to study Environmental Science.